Wild Cherry Bark is a fine expectorant that loosens and expels phlegm from the lungs and has helped bronchitis, colds, flu, dry coughs, tuberculosis and many other pulmonary complaints. It also acts as a mild sedative that not only may calm coughs, but also nervous irritability and nervous indigestion. It has been used for centuries to treat pulmonary conditions such as bronchitis, asthma, dry coughs, tuberculosis, scrofula, and catarrh. Furthermore, its cough-suppressant qualities have been beneficial in cases of a whooping cough, nervous and chronic coughs, colds and influenza; and for that reason, it is familiar to all of us for its use in cough drops and cough syrups. 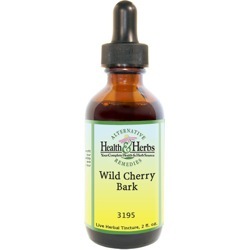 Wild Cherry Bark is considered a mild sedative and has been used to calm irritation, diminish nervous excitability and alleviate nervous dyspepsia. The herb is said to be soothing to the nervous system and has been used to slow a nervous, rapid heartbeat (tachycardia) and help a heart that is characterized by a feeble pulse (bradycardia) or frequent, irregular heartbeat (arrhythmia). Cardiac friendly, Wild Cherry Bark is also thought to be helpful for high blood pressure. Wild Cherry Bark is believed to be very beneficial in cases of dyspepsia, poor digestion, gastritis, excess flatulence and general indigestion. Its astringent qualities may also help to relieve diarrhea, colitis, and dysentery. Wild Cherry Bark is reputed to have parasiticidal qualities and has been used to destroy and expel parasites and worms from the intestinal system. As a diaphoretic, Wild Cherry Bark encourages sweat, and the increased perspiration helps to cool the body, bring down fever and expel toxins through the skin. Wild Cherry Bark is believed to possess antioxidant properties that may be helpful in the fight against the oxidative damage to cells and tissue caused by free radicals. Its amygdalin content is believed to be the active constituent responsible for this effect. Used externally, Wild Cherry Bark has been included in poultices that may be applied to relieve ulcers and abscesses. Ingredients: Wild Cherry Bark, Structured Water, 20% Alcohol. Non-Alcohol: Wild Cherry Bark, Structured Water, Vegetable Glycerin. Contraindications: Pregnant and nursing women should not use Wild Cherry Bark Herbal Supplement, nor should people who are being treated for hypotension. From Ron Ring of POLAND, Ohio on 7/8/2017 .